I have been a model railroader for many years. My first layout was the classic 4×8 sheet of plywood. It was placed on top of an old pool table that was no longer used. I built several track arrangements on the surface and learned a lot about what works and what does not. I did my first scenery on that layout, first sectional track, first flex track and many other firsts. I learned much from my 4×8 layout. Many experienced model railroaders will tell you the 4×8 sheet of plywood is a bad idea. It is restrictive, will grow boring fast and takes a lot of space that could be better utilized. Byron Henderson, in his article “Why Waste the Space on an HO 4X8?“, discusses some very good reasons and alternatives to 4×8. These are all valid facts, but all fail to consider the position of the model railroad rookie. A model railroad rookie needs to get something started, try something new and play with it with little to no effort. The 4×8 sheet supports this endeavor. I believe that new model railroaders should be encouraged to build a 4×8 layout. The simple sheet of plywood creates a surface where the rookie can play and begin to work with the materials and concepts of the hobby quickly. They do not need to learn other skills first like planning, layout design and bench work design. We are model railroaders because we want to run trains, not learn about design and construction. A new modeler’s first layout, 99% of the time, will be thrown away in the end. This is not because the layout was done poorly, but because the modeler has expanded their knowledge through trial and error, and wants to do more. The other advanced skills will come later when they want more from the hobby and go beyond the 4×8 layout. A rite of passage is a ritual event that marks a person’s transition from one status to another. Since a first layout will nearly always be dismantled in the end, why not promote the 4×8 as the Model Railroading Right of Passage? Many experienced model railroaders act like well meaning, overprotective parents. They hope to save the inexperienced rookie from making the same mistakes they did. 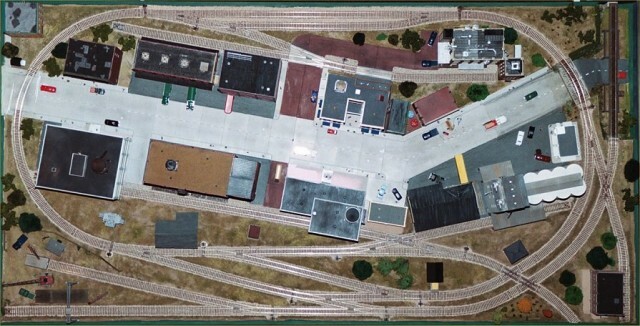 Most experienced model railroaders (dare I say) started on their own 4×8 layout. They learned the pitfalls and they learned that the hobby was fun. They had enough fun with it to stay in the hobby, learn from the their mistakes and go on to build better layouts. Gorre & Daphetid by john Allen is one of the most celebrated layouts to have ever existed. It started life as a 4 x 8 layout. Next time a rookie asks about starting in the hobby, promote the 4×8 so they may have fun and learn (like you did). These are useful ideas. The essence is 1) give newcomers an entry point which is not too intimidating, and 2) that provides enough near-term success to be gratifying. Then, provide a path forward that allows for trial and error and revision and success. That said, I’ve been dreaming of Free-Mo semi-kits, with a single track, a single turnout (with ground throw), and basic wiring. Probably no legs or scenery. The newcomer could add track off the turnout, add terrain, structures etc. Yes, this was the intent of the article. A newcomer needs to do something and get their feet wet. I agree Free-mo is a great place to start! 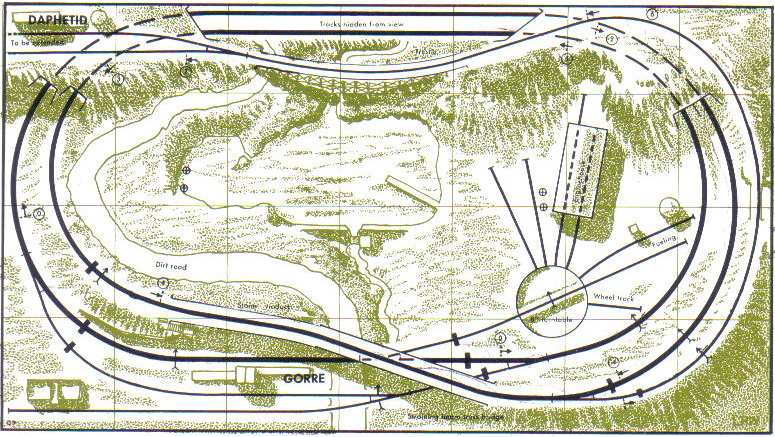 Excellent arguments for good reasons, and that St. Louis layout looks like a primer on just about everything. Maybe Woodland Scenics could package it as kits. I agree, amazing how much they packed in there! I came upon this because it’s exactly what I’m doing. I’ve read a ton of stuff about model railroading but have no experience. My idea was to build an 8X4 layout to learn/make mistakes. I have no intention of this being my final layout. It will be taken apart and what can be salvaged, put into a more interesting layout, which fits the space better. Thanks for confirming my initial thoughts on how to get into this hobby. I read with interest your comments on the 4×8. I am a lifetime model railroader, and unlike most I feel the 4×8 layout is an art form in itself. A well designed 4×8 teaches you about compromises and selective compression out of necessity. These concepts are necessary if you are going to eventually have a larger layout that actually captures the essence of the real thing. One thing that helps when designing a small layout is to think vertically. This seems to be lost on the anti 4×8 crowd. With only 32 square feet to work with, vertical separation between scenes helps the overall effect, and the grades keep train length short. I agree, it is an art form and those are great points on vertical separation!